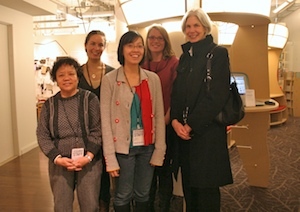 Amy Ryan, President of the Boston Public Library, dropped in at the Storefront Library during our open hours today. She spent time talking with staff and volunteers, and we showed her some of our initial usage data and described our operations. We also talked about how operating in a street-level storefront space encourages us to think like retailers—we can see immediately how the placement of signage, books, and materials in the window affects whether or not people stop to look inside and visit. Ms. Ryan was last in the Storefront Library at its opening ceremony. She and her staff also met with us several times prior to that, in the spring and summer of 2009 when we were planning the project. We were excited to show her the library in action and appreciate the time she spent visiting. Are you interested in libraries? Drop in or drop us a line—we’ll show you around.